These vegan cauliflower tacos with vegan yogurt garlic sauce are the perfect comfort food! They’re super crispy, easy to make, and sooo delicious!! Ever since I’ve tried cauliflower wings for the first time, I can’t get enough of them. Neither can my hubby! He’s actually even more obsessed with them than I am. So when I suggested to make vegan cauliflower tacos, he was totally in. And they turned out so delicious! I basically used my recipe for the cauliflower wings that I posted last summer. I usually add a bit of sriracha to the BBQ sauce to make it spicier. But of course that totally depends on your personal preferences. When I first made cauliflower wings, I only coated them with a mixture of flour and spices for the first round in the oven. For the second round, I then added BBQ sauce. However, after a couple of times I started to also roll the cauliflower wings in panko bread crumbs before baking them for the first round. This made them so much crispier. So I highly recommend using panko bread crumbs for the coating. As always, you can find the full ingredient list and the recipe instructions in a separate recipe box at the end of this post. The ingredient list might seem a bit long at first sight but it contains a lot of spices and other products you most likely got at home anyways like flour or almond milk. I hope you like these vegan cauliflower tacos as much as we do around here. They’ve been a huge hit with us! If you like spicy food, you should also check out my cauliflower buffalo wings. These vegan cauliflower tacos with vegan yogurt garlic sauce are the perfect comfort food! They're super crispy, easy to make, and sooo delicious!! In a large bowl, combine the flour, the plant-based milk, the water, the garlic power, the paprika powder, the salt, and the black pepper. Cut the cauliflower into bite-sized florets. Dip the florets into the batter, so they're completely coated. Roll them in the panko breadcrumbs (omit this step for a gluten-free version and use chickpea flour instead of all-purpose flour). Line a baking sheet with parchment paper and lay the cauliflower florets on the baking sheet. Don't put them on top of each other. Bake for 25 minutes. Remove them from the oven and dip them in the BBQ sauce. Coat evenly. Put them back on the baking sheet. If you want them to be spicier drizzle a bit of sriracha sauce on top or add it to the BBQ sauce before coating the cauliflower wings. Bake for another 25 minutes. For the yogurt garlic sauce, combine all ingredients and season with salt and pepper. 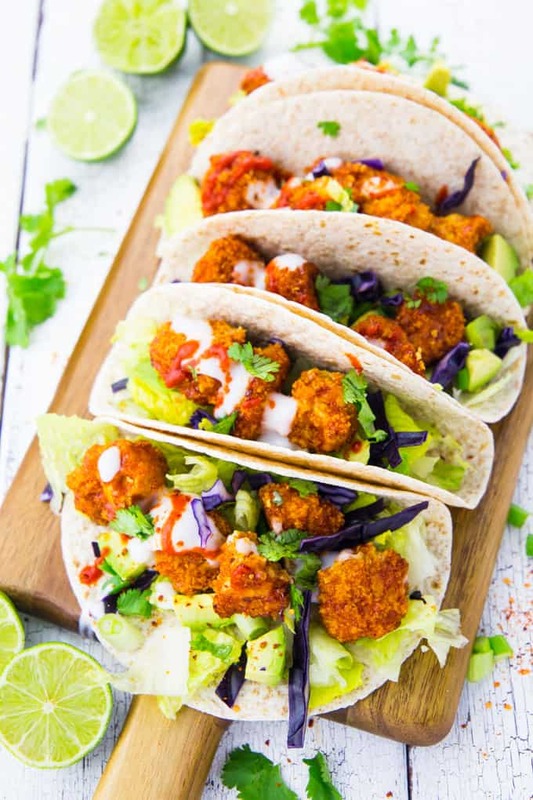 Serve the cauliflower wings on the soft tortillas together with the lettuce, the red cabbage, the green onions, the cilantro, and the avocado. Drizzle some fresh lime juice on top and serve with the yogurt garlic sauce and some more sriracha sauce (optional). Enjoy! « What Do Vegans Eat? – The 55 Most Popular Vegan Recipes! How much water? The amount is not listed, it just says add the water in step 2, but in the list of ingredients, there is no mention of water. Ours were crispy when we took them out of the oven the first time, but after we dipped in bbq sauce and baked again, they were not crispy. Any idea what we did wrong? The flavor is great anyway. Idk what may have gone wrong but I decided not to dip them and instead drizzled the BBQ and siracha over them before putting them back in the oven and they still came out crispy. These were so delicious! My hubby totally loved them :-) I will definitely make them again. So good! I’m not vegan, so I used milk and regular yogurt. I’m also not a spicy person, so I mixed bbq with a garlic parmesan sauce. I also whipped up a cheesy dip to drizzle over the cauliflower once on the taco. I will be making these again! WHOA, my beloved taste buds, calm down! I know you’re dancing and singing right now because you were just treated to the best tacos EVER! Seriously, from bite one, these are dreamy and the flavors all hold their own little punch. While my wife thought it was perhaps a bit saucy, I loved them. Thank you for sharing this!